Pottery remains discovered in a cave are 1,000 years older than the previous record-holder. 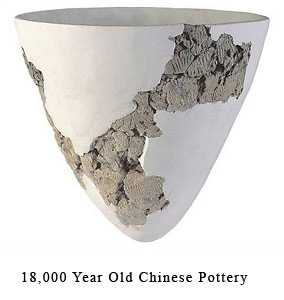 Chinese and Israeli archaeologist have discovered the oldest known pottery, remains of an 18,000 year old cone-shaped vase excavated from a cave in southern China. The shards are about 1,000 years older than the previous record holder, found in Japan. After flint tools, pottery is one of the oldest human-made materials, and tracing its development provides insight into the evolution of culture. the shards were discovered four years ago in Yuchanyan Cave in the Yangzi River basin by a team led by Elisabetto Boaretto of the Weizmann Institute of Science in Rehovot, Israel. The cave shows signs of human occupation from about 21,000 to 13,800 years ago. The problem with caves is that, over time, remains from fires and other artifacts get scrambled by the activities of humans and burrowing animals, mixing layers of artifacts and making dating difficult. Boaretto, Ziaohong Wu of Peking University in Beijing and their colleagues circumvented this problem by focusing on excavating a small area, only a quarter of a yard square, and carefully analyzing each layer of sediment. They reported Monday in the Proceedings of the National Academy of Sciences that radiocarbon dating of charcoal and bone fragments from the excavation produced dates that were consistently older with increasing depth. Radiocarbon dating of charcoal and bone collagen fragments found immediately above and below the pottery shards indicate that the shards are 18,000 years old. The team has been able to reassemble the shards into the partial remains of an unadorned cone-shaped pot or vase, about 11.4 inches high, that was probably used for cooking or storage.